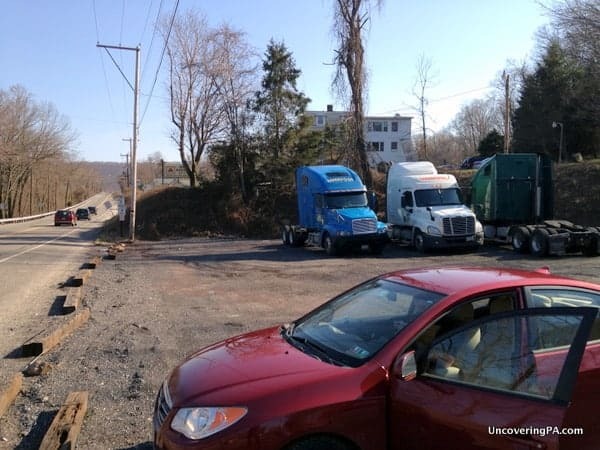 Passing motorists on highway 322 or the combined 11 and 15 just outside of Harrisburg might notice something odd atop an old railroad bridge piling in the middle of the Susquehanna River. In the few fleeting seconds that it’s visible from either road, it can elicit an almost confused feeling. I’m sure the words “Was that the Statue of Liberty?” have been uttered more than a few times by those driving by. In fact, it is a replica of the Statue of Liberty. The current Statue of Liberty is actually the second one to stand in that spot. The first, made of plywood and venetian blinds, was put in place on July 1, 1986 to help commemorate the original Statue of Liberty’s 100th birthday. Placed in the middle of the night by a mixture of patriots, artists, and pranksters, the statue stood for six years until it succumbed to the elements. However, by that time, the statue was so popular that another, more sturdy version was in the works. The current statue, set in place by a helicopter in 1997 is made of metal to ensure that it lasts for many more years to come. 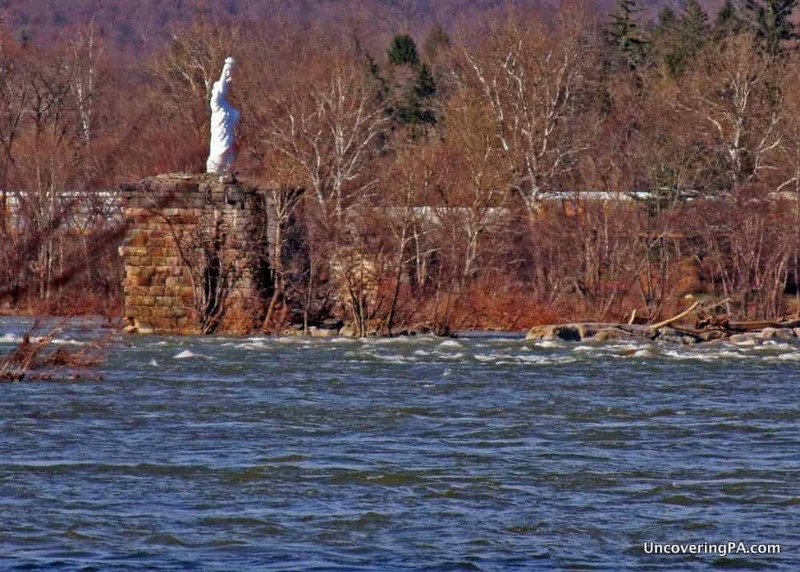 Standing 25 feet tall, the statue sits atop a railroad bridge piling of 32 feet that hasn’t been used since the 1880s. 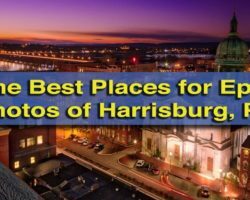 It’s located in an area of the Susquehanna River known as the Dauphin Narrows. This section of the river can be dangerous at times, making it difficult to get close to Lady Liberty by water. There’s always the fleeting glances from the highways, but I wanted to find a better vantage point. With this in mind, I started looking at Google Maps. It quickly became obvious that the best land view is from the western shore of the Susquehanna River near Marysville in Perry County. I set out on a beautiful Saturday afternoon with a few friends who were ready for an adventure. Our first attempt was down a dead end street along the water’s edge in Marysville. We knew that we would need to do a bit of hiking from the end of North Main Street in Marysville, but were hoping that there would be a convenient place to park and maybe even a trail. However, when we reached the end of the street, we were met with “No Parking” signs and five “No Trespassing” signs. This clearly didn’t seem like our best option. Next, we drove north along highways 11 and 15 hoping that we might find somewhere to park that offered a good vantage point. Unfortunately, while you can get a good view of the statue’s backside from a bridge along the highway, this is only a good vantage point for those looking for a quick glance and maybe a photo of the Statue of Liberty from behind. We decided to make one more attempt at seeing the Statue of Liberty of Harrisburg. This time, we were simply looking for anywhere good to park the car while we hiked down to the water’s edge. Soon, we came to a truck parking area next to a State Farm office (see map below for reference). The best parking area for a hike down to see the Statue of Liberty. Parking the car here, we carefully crossed the 2-lane highway and made our way down the hill towards the railroad tracks. The next step was to cross the four rather busy railroad tracks. Once done, we only had about 150 feet of forest standing between us and the water’s edge. Heading upstream, we eventually saw the remnants of the old railroad bridge down the hill in the distance, with a very overgrown “trail” leading down to it. 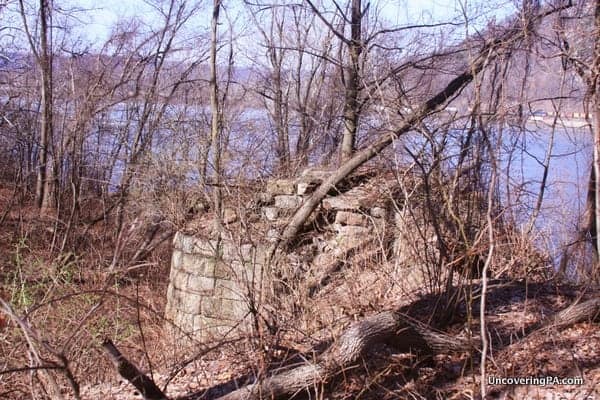 When you see this old railroad bridge piling, head down along the left side of the structure. Picking our way through the underbrush and muddy terrain, we eventually reached the water’s edge and got what is undoubtedly the best view of the Statue of Liberty from land. Don’t get me wrong, it’s not an amazing view; she still stands several hundred yards away. However, if you want the best possible land view of the Statue of Liberty in Harrisburg, this is definitely it. When I visited, I unfortunately neglected to bring my telephoto camera lens, which would have likely led to much better photos. I would highly recommend you bring a high-powered zoom lens for your camera if you want to get some good shots. Binoculars would be a great addition as well. The four train tracks you have to cross are heavily used. Cross with great caution. It’s also worth noting that this adventure isn’t for the timid. It requires crossing four railroad tracks which can be dangerous and might technically be illegal. Also, while I didn’t see any “No Parking” signs in the parking area, I can’t promise that a local police officer might not think otherwise. This is very much an attempt at your own risk adventure, and as such, I can’t recommend you following in my footsteps. However, if you must go, I’ve provided a map below that shows the location of the Statue of Liberty, as well as the approximate location of the parking area and viewing area. Again, if you wish to attempt this trip, please use extreme caution. Very true. I’ve heard it’s a challenging section of the river, though, so make sure you use caution if you attempt to see it that way. 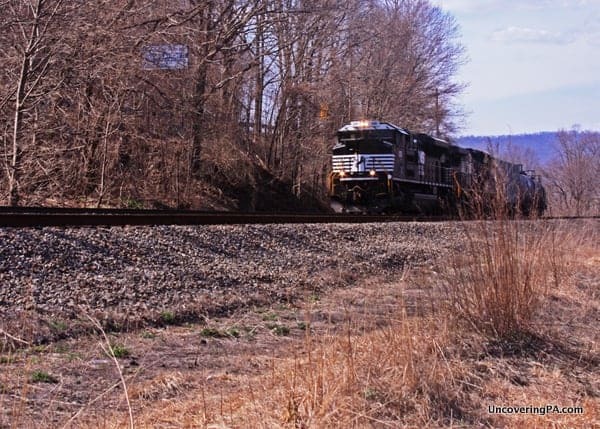 While Tuesday was about education, on Wednesday the Norfolk Southern and Amtrak police planned to issue citations for anyone caught trespassing. 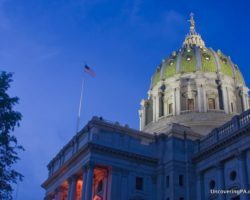 Under state law, a first charge is a summary offense that comes with a maximum $300 fine. 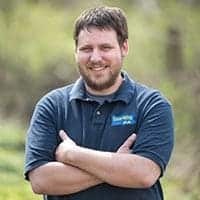 Additional trespassing charges, including criminal trespass, merit misdemeanor charges that can come with stiffer fines and possible jail time. I haven’t had a chance to check it out. The east shore does seem like it might have better views, but private property signs and the road make it hard to find a good vantage point. 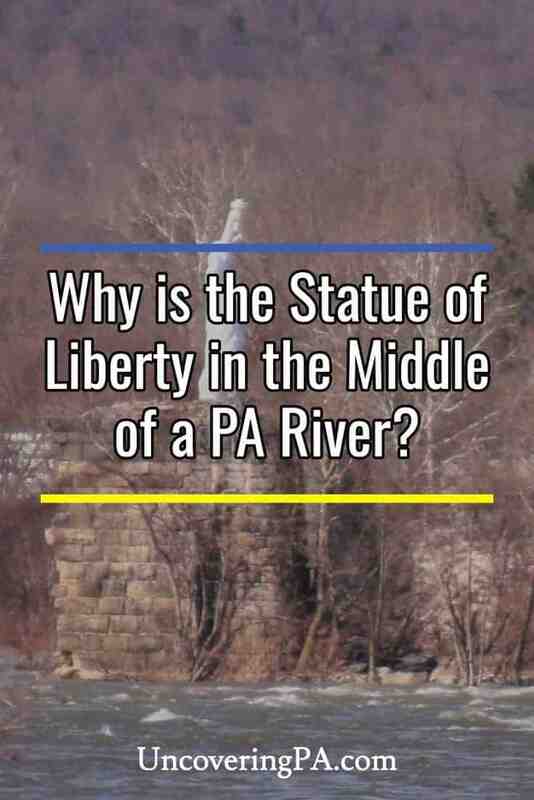 I’ve always loved seeing PA’s own statue on trips to Hbg. It was, Megan, but that was back in the 80s. Your history may be accurate about the current statue but I think originally it was part of a Boy Scout effort in 1949, I think,. They joined with someone else and had 200 statues made, one for every state. Very few still remain. I always was told ours was one that survived near our capital. 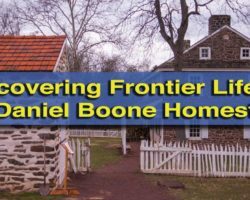 Check out article in scouting magazine, ” little sisters of Liberty” by Marti Attoun. It’s possible that that may have been the origin of the idea, but I know that the original one of this location, and the replacement one that is currently standing, we done as a guerrilla art project. 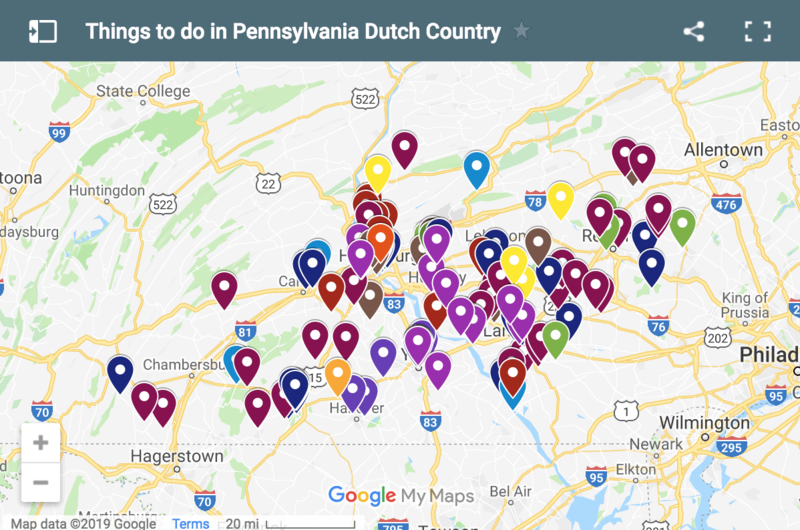 Since you live in Hbg, I’m surprised your interactive map has only factory tours in York. Granted, York is the Factory Tour Capital of the World, but there are more places to visit. 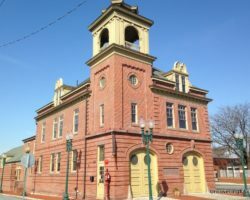 Historically, the Firt Capital Courthouse, Gates House and Plough Tavern. Oddities: Bob Hoffman weightlifting statue, Haines Shoehouse. Drive a half hour south and check it out. I’ve been to a few of those, but haven’t had a chance to write about them yet. Once I have the chance to share more of my adventures in York, I’ll be adding them to the map. The comment concerning the trespassing laws, if we really cared, we would look them up ourselves.